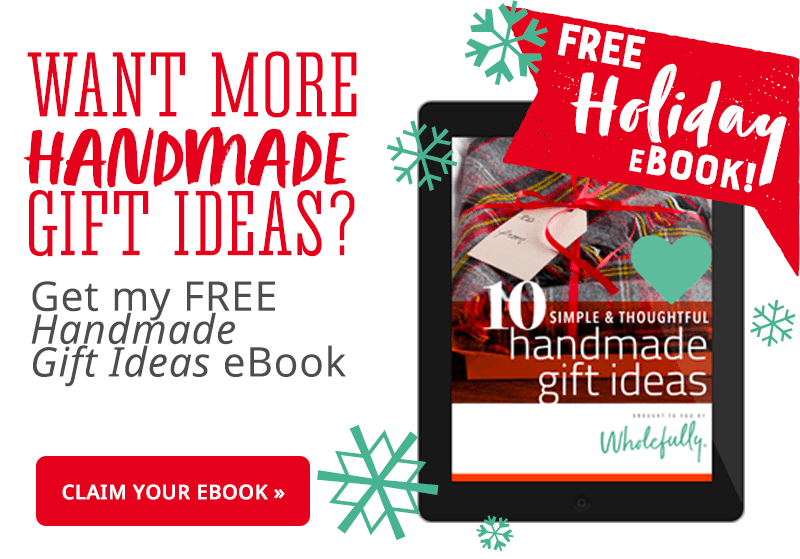 Day two of the Handmade Holiday 2015 series, and I think we’re already settling into a theme—gifts that keep people cozy. Yesterday, it was the No Sew Flannel Blanket Scarf tutorial. And today, I’m showing you how to warm your loved ones from the inside out with a hearty Spicy Black Bean Soup in a Jar. Melissa from Bless This Mess (my partner-in-crime in this handmade gifting spree) is showing off how to make super easy, super awesome Simple DIY Beeswax Candles to help cozy up your home, too. These candles burn so clean and smell like warm honey. Who doesn’t want their house smelling like warm honey? I know I do! I can’t wait to make some of those candles to gift to myself! But let’s get back to what’s happening over here. This soup mix is so easy to put together, and the resulting soup is SO tasty and SO easy to make! Unlike a lot of soup mixes in a jar, this one comes with everything you need to make the soup. All you add is water (plus any toppings you want). It seems hard to believe that something so simple could be so delicious, but it is packed with flavor! We love this soup (especially when served up with some cornbread). When I told Melissa that I was going to do a soup in a jar for our week of handmade gifts, she said that she loves things like this because, by the time Christmas rolls around, she is so sick of cookies and cake and fudge. I am totally the same way! The sentiment of tray after tray of cookies is nice, but right around December 17th each year, I start to crave veggies and water and healthier options—like a hearty, fiber-packed black bean soup. It’s a great option for everyone on your list, because you can easily customize it to be vegan and gluten-free! Let me show you how easy this soup in a jar is to put together. First up, gather your supplies. 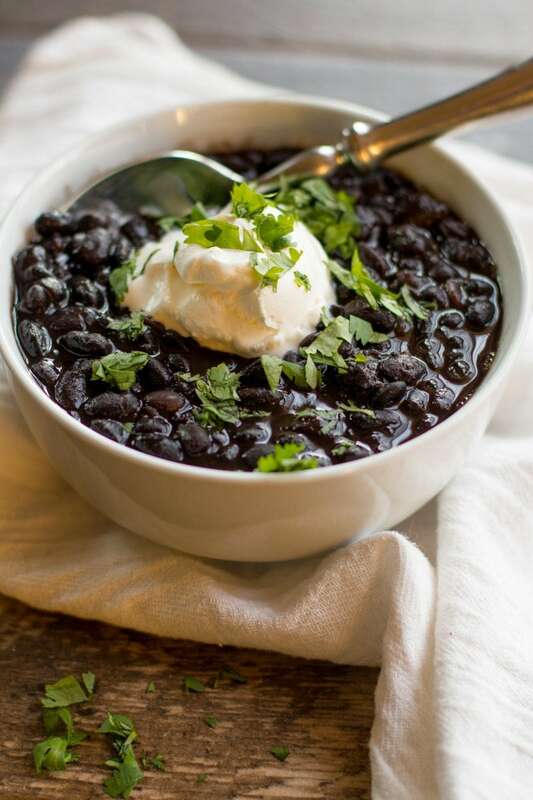 Honestly, you could just use 100% black beans, and the recipe would be just as awesome. 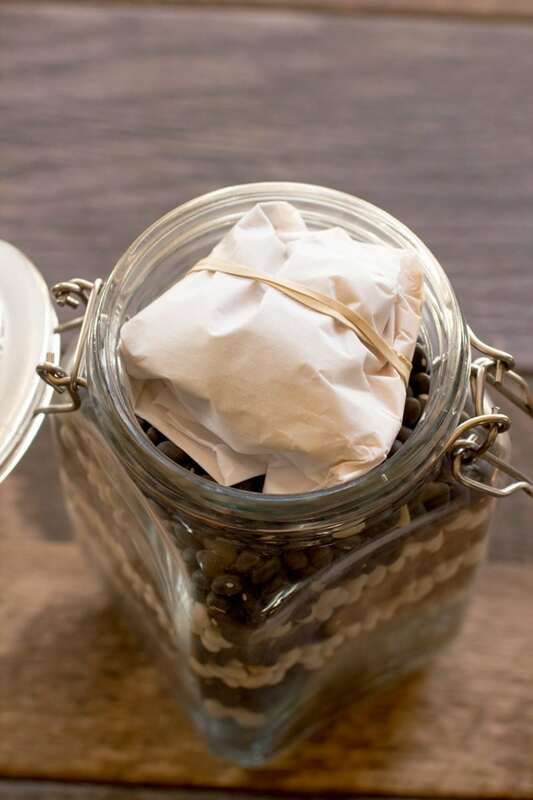 The only reason I use white beans is so the jar looks all pretty with the layers! 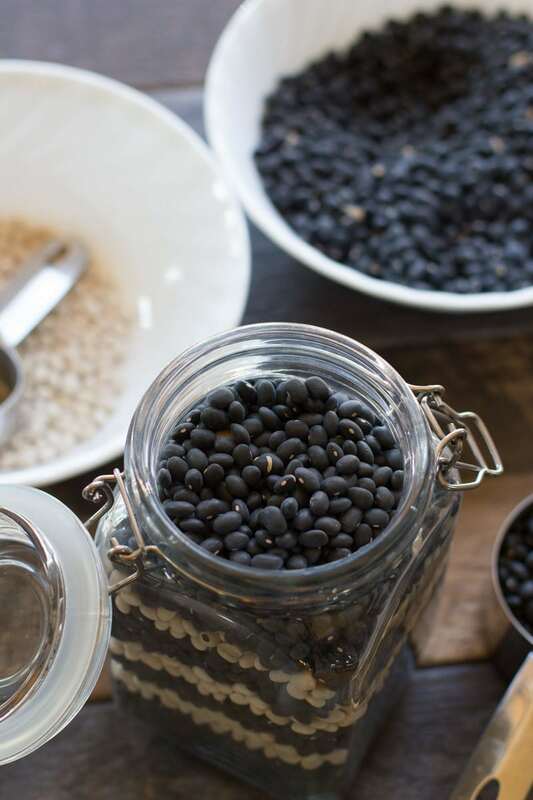 Fill your clean jar with 3/4 cup black beans, followed by 1/3 cup white beans, and then repeat, ending with the last 3/4 cup of black beans. 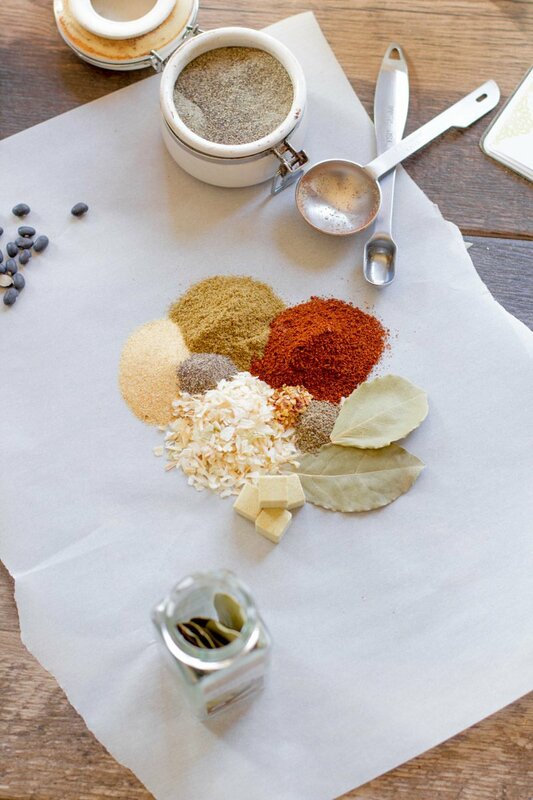 Place all the spices in the middle of the piece of parchment paper. Then, roll up the sides to make a little packet. Secure the packet closed with a rubber band. You can also use a small zip-top plastic bag for this, if you prefer. Stuff the closed packet into the top of the jar. You might have to use a little elbow grease to get it in there, but it’ll go. Then close up your jar. I created a PDF with the tags that you can download for free. I printed mine out on heavy kraft paper card stock. 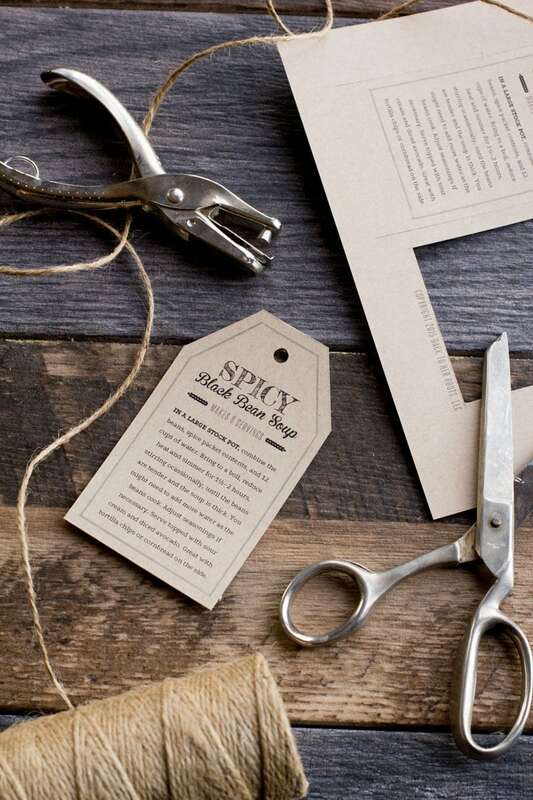 Cut out the label, use a hole punch to punch where the “x” is, and then tie it onto the jar with twine or ribbon. 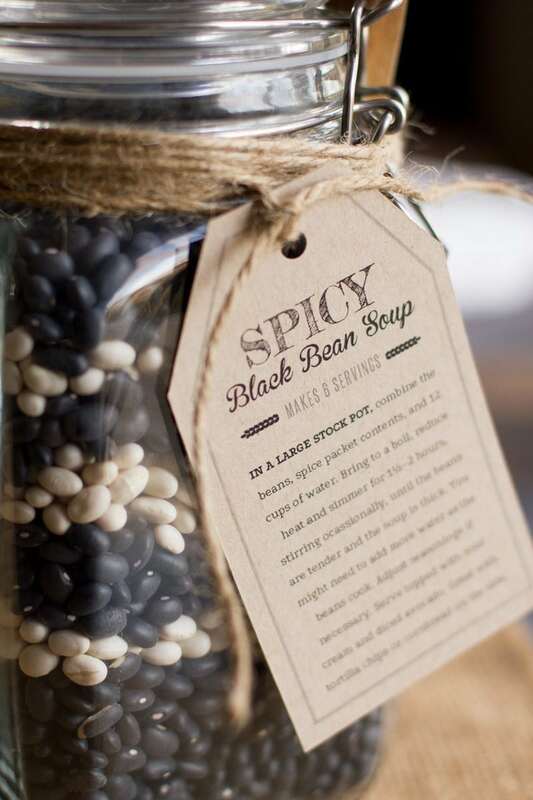 In a large stock pot, combine the beans, spice packet contents, and 12 cups of water. Bring to a boil, reduce heat and simmer for 1½–2 hours, stirring occasionally, until the beans are tender and the soup is thick. You might need to add more water as the beans cook. Adjust seasonings if necessary. Serve topped with sour cream and diced avocado. Great with tortilla chips or cornbread on the side. 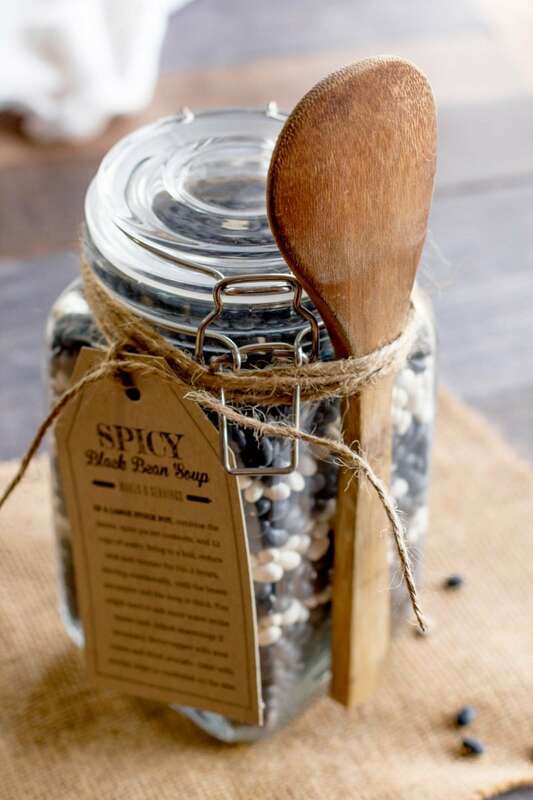 I think adding the wooden spoon to the side of the jar is a nice touch, so if you want to do the same, just tie the spoon on to the side with the twine. And that’s it! Your gift jars are complete. You could easily pump out a bunch of these, assembly line style, in less than an hour. 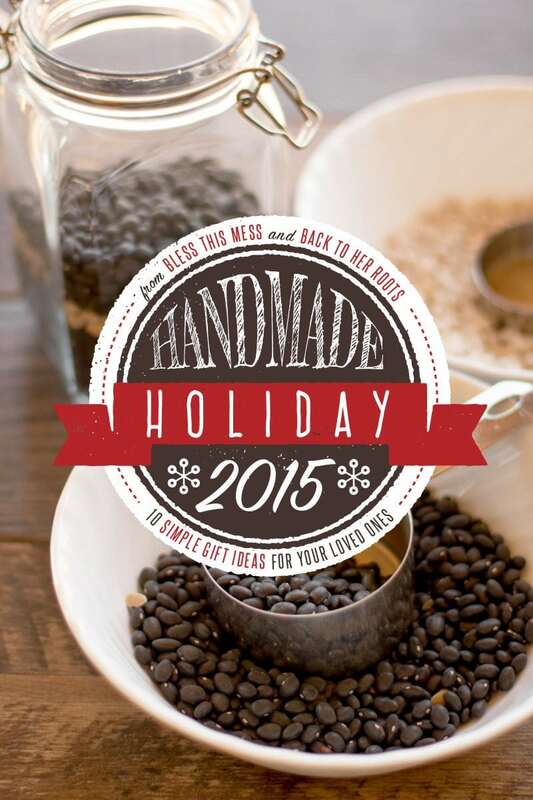 Make sure to come back tomorrow, when Handmade Holiday week continues. Tomorrow I’m back with another food gift that is perfect for all the healthy foodies on your list! See you then. Wow! What a gift idea! Bounced over from Bless This Mess. Think I will bounce more often! This is a great idea! I will send a jar full to my daughter who lives way too many states away. When she wishes she had Mommy to cook something Mommyish for her….presto! This would be great for 2 of my coworkers. If this was assembled & cooked in a slowcooker, how long do you think it would take? Usually I soak my beans overnight before making soup. Would the directions change if the beans were soaked? I wouldn’t recommend pre-soaking, it’s the long/slow cooking in all the spices that adds so much flavor to the soup! You have to either soak beans overnight OR boil them for at least 5-6 min to breakdown tough skins. Otherwise you end up with flavorful HARD beans. The slow cook process flavors them but if beans are not pre softened they remain hard No matter how many hours you cook them. I am at high altitude in west so need more minutes than 1 boiling but my mom on east coast always soaks her beans overnight. Good bean reference Ranchogordo.com they grow their own beans and pub bean cookbook. We love their beans! Many heirloom varieties for even prettier colors and flavors in soups. I’m 70 years old and I never soak beans, unless I want them in a hurry! It’s the long slow cooking that makes them sooooooo good! That’s a lovely idea to put a salted recipe in a jar for a change! I used one of your pictures on my blog, please tell me if you want me to remove it! 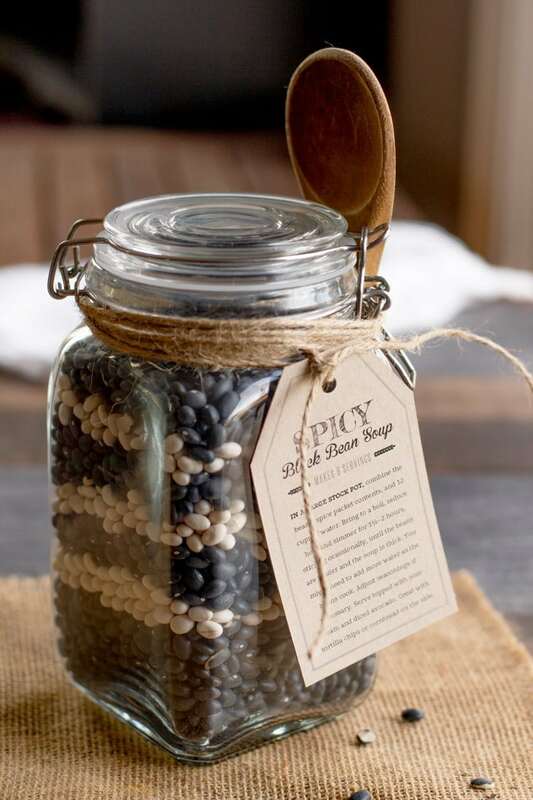 Awesome, this handmade bean jar looks so vintage, I can’t wait to make my own one and send to my girl friend birthday. Thank you so much for this great idea! Looks easy and pretty! I want to try this now! It can be a perfect gift for my friend! Thank you! It is look simple recipe, but I have never try before. Will try on this weekend. Thank for share ! How many people should one jar feed? one? Two? I could only find large bullion cubes (2 cups of water per cube) — would I still need 4, or just 2? Thanks for amazing recipe. It was very east to made. Why can’t spices just be added to jar since cooking all at once? If you prefer, they sure can! Some folks like to sort/rinse beans before cooking. Looks pretty! It is look simple recipe.Thank for share ! I believe you would just need to double check all your spices and seasonings to make sure they are gluten-free.